I have written extensively on the benefits of using chords in piano teaching. Chords are a great way to get your students learning musical concepts, playing pop music and perhaps most importantly, creating their own compositions. I created my 4 Chord Composing online course to assist teachers in getting their students – of all abilities – composing music from an early stage. Many teachers don’t have much experience in getting their students to write music – it can be a daunting task! That’s why I put this online course together, and I hope it can help you. Watch lesson one of my 4 Chord Composing course right here. My 4 Chord Composing course is available to members of my Inner Circle community. You can get access today and take $150 off an annual membership just by clicking on this link here. I’ll see you in the Inner Circle! If you need a bit more convincing, here are some free resources to help get you on your way teaching chords. Teaching students about chords and how easy it is to compose great sounding music through a chordal approach is one of my favourite activities in a modern piano lesson. In this training, I’ll take you through my 4 Chord Composing approach so you can get started with these ideas straight away. It’s perfect for transfer students, teens and adults in particular. 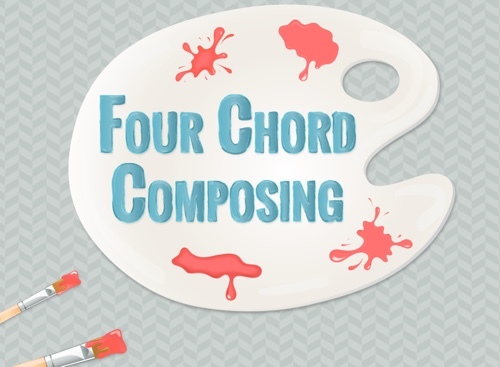 You can catch a free replay of my 4 Chord Composing webinar online at a time that suits you. Click here to see when the next replay is and enjoy one-hour of online training. You can have the first three lessons in my 10-week 4 Chord Composing right now! Feel free to download these lessons and implement chordal teaching in your studio. Make sure you check out some of these fantastic chord-related blog posts. What Is the Difference Between a Chord Chart and a Lead Sheet?